Passersby enjoy a reading by artist Antonia Kao’s daughter Anja (7). Through the 70s, 80s and 90s, sci-fi scribe Harlan Ellison attempted to demystify his creative writing process by performing his craft in public in bookstore windows. This style of literary event was admittedly a bit schticky for the prolific author but they that raised money for charity and brought attention to independent booksellers across the nation. Local conceptual artist Antonia Kao inverts Ellison’s erstwhile project with her own whimsical reversal, “The Reading Window,” in which readers are on display, reading aloud from kid-friendly literature. The readings, which began Nov. 5 and continue from 6 p.m. to 8:30 p.m., Monday through Saturday until Nov. 22, occur in the children’s display window of Copperfield’s Books on Kentucky Street. Inside, the display has been transformed into a magical kid’s treehouse and each evening a different live reader sits on a little stool and reads to a semi-circle of stuffed animals – inside – and passersby – outside. A couple of months ago, Kao decided it was time to jump on the idea and approached the bookstore’s management. 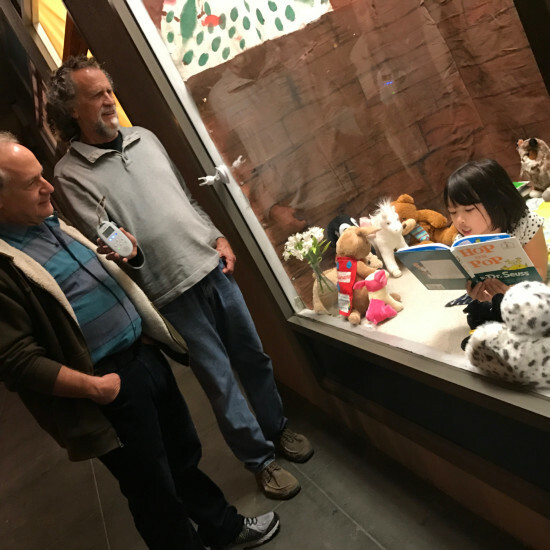 Though the store’s window content is booked up to two-years in advance, the children’s display window was available and Kao seized the opportunity to add a different dimension to how literature can be enjoyed. Beside Kao herself (who will be reading “Alice in Wonderland”) the remaining readers include Megan Berka, Treja McClish, Lori Brooke Diana Marto, Soneile Hymn, Beverly Alexander, Susie McGavin, Amy Malaise, Staci Stern, Katie Svienson, and Sharon Cooper reading her own book “Gymnastics Day with Silly Sammy.” A bevy of younger readers will also participate, including Kao’s own seven-year-old daughter. A sound system helps convey the readers’ voices through the glass so they can be heard on the sidewalk-side of the window. That said, a couple of readers have opted to read in silence. Either way, the effect should be interesting, suggests Kao. “I just hope they’re delighted by it,” she says with a smile. Clearly, Kao relishes the “surprise” factor of having a real human rather than a mannequin in a store window. The Reading Window runs from 6 p.m. to 8:30 p.m., Monday through Saturday until Nov. 22 at Copperfield’s Books, 140 Kentucky Street, Petaluma. For more information, visit Kao’s site at divine-eye.com.